We are fortunate to engage actively in outreach by sharing research experiences, engaging citizen scientists, mentoring junior researchers, and involving diverse members of our community in the process of scientific inquiry and our enthusiasm regarding biological diversity. Here are a few of our activities. SANITY is a field-research experience for high school students led by TUSD teacher Margaret Wilch and colleagues at Tucson High Magnet School. 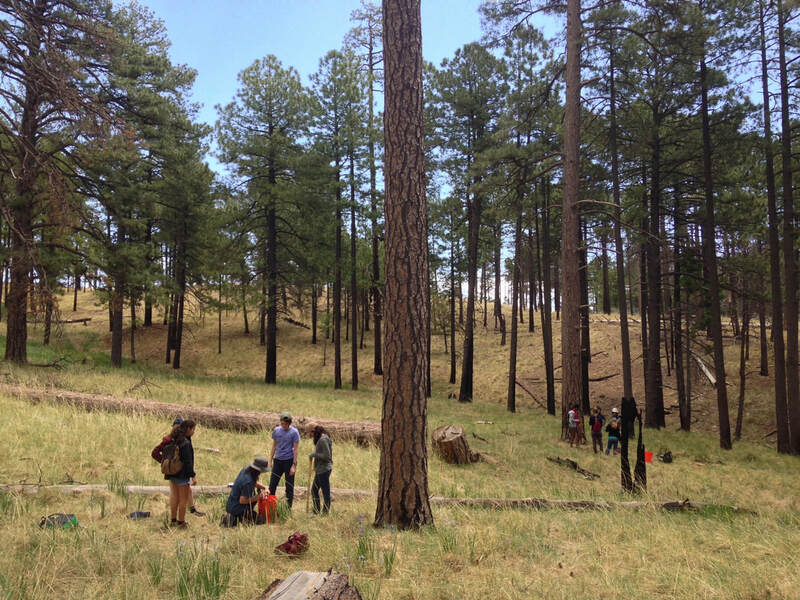 As part of the students' week-long experience, we lead 15-20 Tucson High students through field- and laboratory research to discover fungal symbionts of plants at the American Museum of Natural History's Southwest Field Station in the Chiricahua Mountains of Arizona. Students develop hypotheses, conduct field sampling and microscopy, and analyze data to detect environmental factors influencing the distribution of mycorrhizal symbionts. BLAST is a three-week summer program for high school teachers interested in learning more about biotechnology and the applications and fundamentals of molecular and fungal ecology. Led by University of Arizona undergraduates and graduate students in the Arnold lab, and in collaboration with teacher Margaret Wilch, BLAST helps students master laboratory skills and engage in mentored research. We recruit 15-20 students/teachers/year for this fun and engaging program. The Tucson Festival of Books draws thousands of members of the public to the University of Arizona Campus each spring. Science City exhibits within the festival convey all aspects of science to children and their families from Tucson and beyond. The University of Arizona Campus Herbarium offers a hands-on open house/tour through the Festival, and our group shares fungal and microbial diversity with >200 diverse visitors each year. We pair these formal events with informal tours of the collection for students and the public throughout the year. 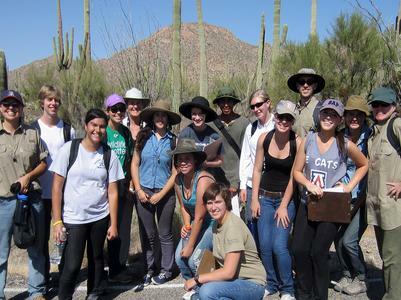 We host 70-120 high school students per year for a two-month workshop on fungal biodiversity at the University of Arizona. Students rotate through stations focused on fungal diversity and systematics, applications of fungi, and molecular biology of fungi. In the last of these stations the students vouchered plant-associated fungi, extracted DNA, and prepared for PCR (which they conducted in the biotechnology labs at Tucson High Magnet School or in AP Biology classrooms at Sahuarita High School). Our outstanding 'citizen scientists' contributed directly to a new perspective on fungal biodiversity through their weeks-long involvement in our research program. We welcome high school students for interactive tours of our labs through the USDA-APHIS / UA partnership program, AgDiscovery, in June 2015. 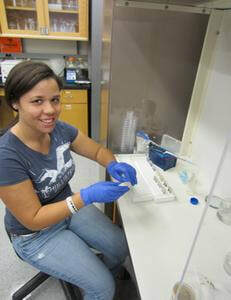 Students from diverse backgrounds participate in research activities and learn about microbial diversity. Each year we engage high school students in our lab, where they conduct independent-mentored projects with project personnel. Students go on to present their work at local, regional, and national science fairs and related competitions. We are proud to have worked with students who have gone on to the International Science and Engineering Fair; students who have been recognized as Regeneron Scholars; students who are excited about science and willing to engage their bright curiosity in the process of discovery; and students who are the first in their families to engage in science as a potential career. We have been fortunate to partner with educators across Arizona to engage K-12 and tribal college teachers in research. From summer projects in Tucson to field experiences in Panama, teachers have been involved in our projects and have translated their experiences back to urban, rural, and STEM-serving institutions statewide. For four years we coordinated a 10-week summer research experience for students at Diné College, the college of the Navajo Nation. 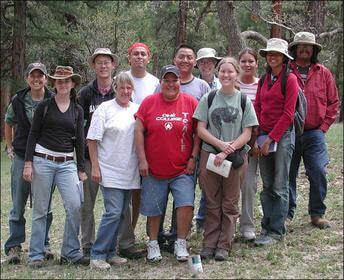 In collaboration with Diné College instructors Barb Klein and Mary Shimabukuro, we engaged tribal college students in field ecology, molecular biology, and microbiology through summers of student-directed group projects. Publications from these summer projects are forthcoming.